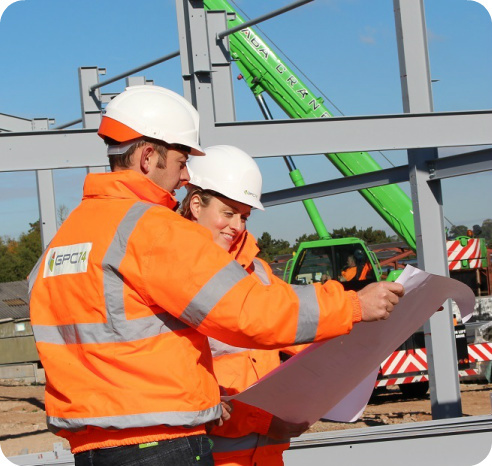 Founded in 1974, GPC74 provides project management, consultancy, design and installation in construction, groundworks, civils, drainage, fit-out and refurbishment. The Company has progressively diversified from carrying out land based operations to offer a diverse range of construction and facilities management services. We offer these multi-disciplined services throughout the UK and this has proved especially invaluable to our clients whose own operational reach extends across the country. By utilising GPC74 in preference to numerous mono-disciplined regional contractors they benefit from a responsive, seamless and cost-conscious service. Group Directors and Company Owners, Louis and Emma Purchase, head an energetic and passionate team that strive to provide the most positive client experience. We have an abiding commitment to both quality of work and client satisfaction that motivates every level of our organisation. Both Directors are intrinsically involved to consistently ensure that we provide our clients with the highest standards of professionalism and attentiveness, whilst also adding that personal touch. We are a family business in the widest sense of the word – not only do we have a husband and wife team leading the company, but many of our employees have followed their fathers into the business, and so we now have sons, daughters, uncles, brothers and other relations working for us, and long may this continue. We strongly feel that this has helped to build a loyal, friendly, highly skilled and experienced workforce which strengthens our operations, ensuring we areable to continue to grow, diversify and excel in all that we do. We have a genuine willingness to ‘go the extra mile’, to resolve the unsolvable and to persevere in triumphing over the most challenging of tasks and deadlines. We never stand still or rest on our laurels, we are always exploring ways of improving or looking for the next challenge or opportunity. It is this commitment that has always served to differentiate us from others, and our values and ethos which binds our team is the source of our continued success and growth.